HuntStand is a suite of web and mobile applications created for hunters around the world to better organize their hunting experience and sharing them with their friends and fellow hunters. There are multiple applications working in conjunction with the main system: the HuntStand web application, the iOS and Android versions of HuntStand Lite, the iOS and Android HuntStand Pro, as well as the iOS and Android version of HuntStand Turkey Hunt. Huntstand is a virtual trophy gallery, social network and mapping tool created for hunters. We created a web API extension to be used by the Huntstand mobile apps (developed by our mobile team). We also added some model and functionality extensions to the web version. The main challenges here were integrating into an established monolith project and becoming familiar with the frameworks used in a short time span. The hardest issue we came across was synchronizing all of a user’s assets across multiple devices and platforms. 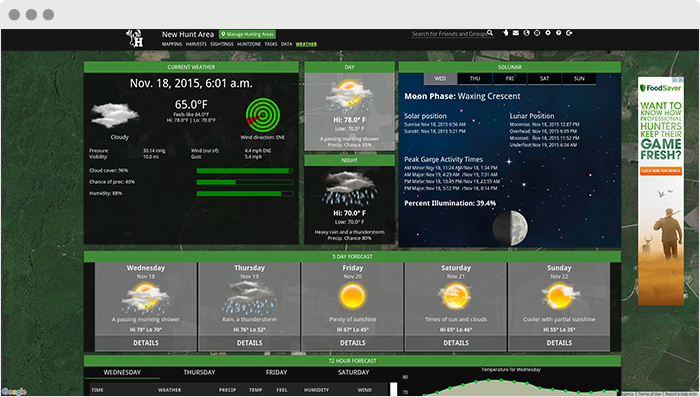 HuntStand Lite, provided to you for free, is a must-have tool for hunting and land management. HuntStand was carefully designed to work in both online and offline environments. Using this app you will have access to offline weather and maps of your hunt areas. HuntZone scent tool shows wind speed, direction, distance, and time in the most streamlined and efficient way possible. HuntZone tracks where your scent will be both at specific time and throughout your hunt, allowing you to plan accordingly. map your property using 43 easily discernible custom icons including game sightings, scouting marks, stands, as well as numerous important objects of interest. HuntStand Turkey Hunt, developed in conjunction with Bone Collector (featuring turkey calls by Michael Waddell) and The National Wild Turkey Federation is a must-have tool for turkey hunters and land managers. HuntStand Turkey Hunt was carefully designed to work in both online and offline environments.